galvanized steel, polybutylene, polypropylene, or stainless steel. Discharge to the floor, to an indirect waste receptor, or to the outdoors. Terminate within 6 inches (152 mm) of the floor or waste receptor. Not discharge in a manner that could cause scalding. Not discharge in a manner that could cause structural or property damage. because discharge indicates that something is wrong. valve discharge piping to the point of discharge. WATTS 210 automatic gas shut-off valve can be used to reduce the risk of damage. 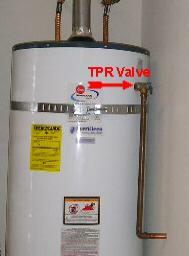 Improperly installed TPR valves are one of the most common defects noted on inspections. occurred due to a malfunctioning TPR valve. Click here to see a water heater explode!